Koh Lipe (also spelt ‘Lipeh’ or ‘Leepae’) is a small island in Thailand (Satun Province), near the Tarutao National Marine Park, on the Andaman (west) coast of Thailand adjacent to Malaysia. It has a small local population of Chao Ley – otherwise known as ‘sea gypsies’ – who inhabit the island throughout the year making a living from fishing in the low (tourist) season, and from tourism in the high season. Click above to hear our Koh Lipe Podcast. This podcast includes a short interview with Pooh from Poohs bar and restaurant, as well as Tina getting bitten by a bunch of angry mosquitoes, again. Two years ago I visited Koh Lipe, and it conjured up memories of the time I spent island-hopping in Thailand in 1991 – a time when even Koh Phangan didn’t have sealed roads. It had that laid-back, lost-in-time feel to it, something I feared could no longer be found easily in Thailand. Tina and I decided we’d head to Koh Lipe this year for a couple of weeks over Christmas and New year. We knew the island would be at its busiest over this period, but had to go over New Year due to work commitments. As soon as we arrived, a few changes struck me – firstly, there was a lot more development taking place – with buildings and bungalows springing up around the island. Secondly, the holiday-makers on the island had, in the space of two short years, changed from being comprised mostly of backpackers & travelers to being more noticeably made up of couples & families. In particular, it was obvious that a few tour operators from Scandinavian countries had started shipping families out to Lipe by the bus load. The increasing numbers of tourists to Koh Lipe has obviously resulted in more rubbish being left behind on the island – and this became more evident the more time we spent walking through the sandy paths criss-crossing the island. Particularly in peak season rubbish-disposal seems to be posing a bit of a problem. Koh Lipe has no sealed roads, and no cars. Yet. A few locals own Honda scooters and they sometimes drive these at break-neck speed down the sandy paths. In the next 1-2 years I expect the first sealed road will be built linking the Chao Ley village to Pattaya beach – the main beach on the island. Despite this development, I felt Koh Lipe still retained its charm. The scenery as a whole in Taratao National Park is stunningly beautiful – with emerald green seas and white sandy beaches in abundance. Koh Lipe and the other islands in Taratao marine park have some of the best diving and snorkeling in Thailand. You can either snorkel straight off the Koh Lipe beaches, or head out on a snorkeling trip as we did. The coral and underwater life was breathtaking and in my opinion it was on a par with Dahab in Egypt where I learned to dive a few years ago. 1) Taking a train or plane from Bangkok to Hat Yai followed by a minibus/taxi to Pak Bara on the Andaman coast, where you take a ferry or speedboat to Koh Lipe. We flew Airasia and Nokair to & from Bangkok. Air Asia suffered from chronic flight delays. 2) Taking a ferry or speedboat from Koh Lanta. There is more information on getting to and from Koh Lipe on the Koh Lipe Thailand website. We’d recommend Mountain Resort (where we stayed) – fan huts during peak season were 600 baht a night – they would be cheaper at other times. Mountain Resort has a great view of the sea looking towards Koh Adang, and in our opinion, although not directly on the beach, it is located above the most beautiful beach on Koh Lipe. Poohs – If you need accommodation, the internet, somewhere to change money or book onward travel, or just a friendly bar and restaurant to hang out in, Pooh’s is the place to go. Following the interview I did with him in the podcast, he asked me to pass on his phone number +66 (0)89 5953737. If you need help – contact Pooh- he’s incredibly friendly and a bit of a Mr Fix It! 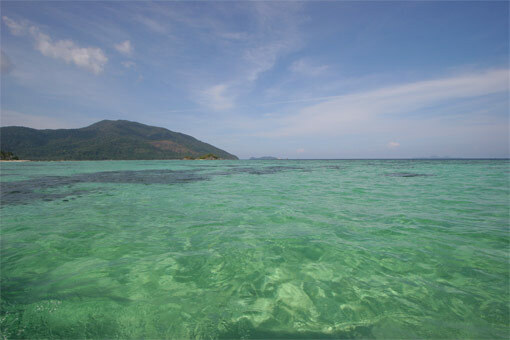 Dang Dee Tour Services – We did our snorkeling trip through Annie at Dang Dee (+66 (0)89 4637801). Her email is dangdeeservicelipe@hotmail.com. The price is about 500 Thai Baht a day, including lunch for a 4-stop snorkeling trip amongst the neighbouring islands. Hmmm, lovely and relaxing podcast. Shame about the wallet! Check out my latest nfs-cast on Ramirez some time Tom, you might like it too! Wonderful, listening to this podcast, I am relaxed already..